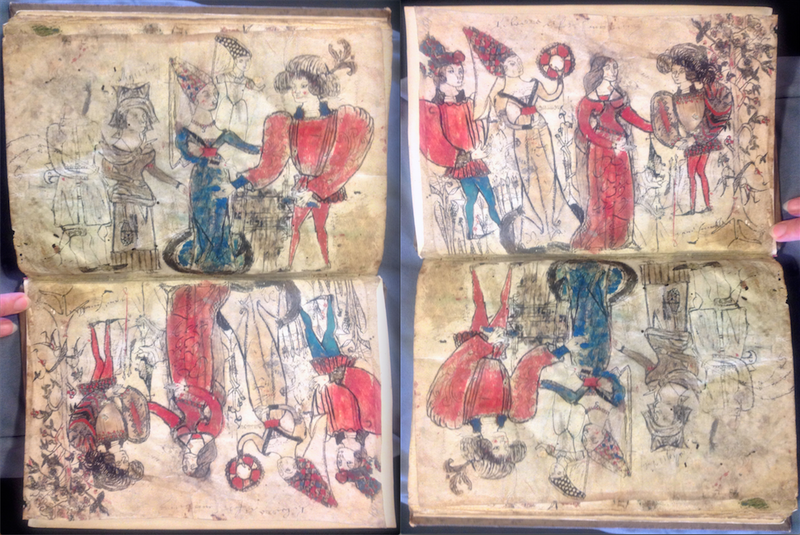 This week’s blog is a show-and-tell of one of my new favourite finds in Leiden University’s Special Collections. Two weeks ago, Turning Over a New Leaf hosted another successful colloquium and Lieftinck Lecture. I coordinated the manuscript display, which included selecting a number of manuscripts to show attendees, choosing which folios to display, and writing a short description to accompany each book. This is normally an easy (albeit time-consuming) task, but this time, the theme was rather outside my usual expertise: vernacular manuscripts. I work with earlier books as a rule – 1250 is very late by my standards – and I stick exclusively to Latin. But, stepping out of my manuscript ‘comfort zone’ proved to be both enlightening and entertaining! 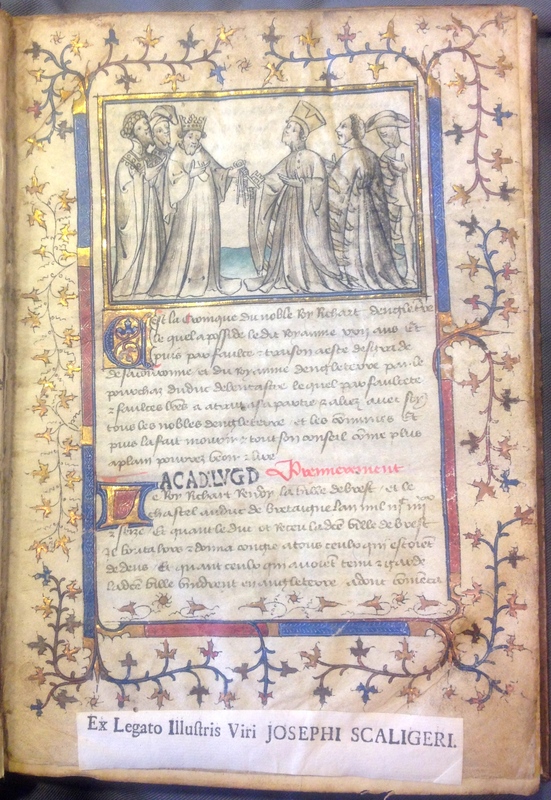 One of the manuscripts I requested to show was SCA 40, a copy of the Chronicque de la traïson et mort de Richart II roy d’Engleterre (the Chronicle of the Betrayal and Death of King Richard II of England) written c. 1401-1425 in France. In addition to a titillating story, it contains several beautiful semi-grisaille (that is, done mostly in grey monochrome) miniatures. Based on the online catalogue information available, I thought it would make for a catchy display. The miniature shown here, at the opening of the Chronicque, shows a glum-looking Richard returning Brest (symbolized by the keys) to the Duke of Brittany, apparently standing on the Breton shore. Leiden Universiteit Bibliotheek Ms SCA 40, f. 1r. Photo JPC Janzen. The text was originally written by an anonymous member of Queen Isabella’s court shortly after Richard II’s death in February 1400. The work is a propaganda piece, intended to provoke French nobles against Richard’s successor, Henry IV. It was revised several times in the first half of the 15th century, eventually ending with the movement of Richard’s remains in March 1406. Altogether there are 37 manuscripts in 4 different versions; SCA 40 is the second version, of which there are 14 other surviving copies. Overall it’s a charming manuscript with a lovely script, appealing miniatures, and humorous catch-word drawings. But it also contains a fun surprise! Looking for scarce information on this manuscript, I turned first to J.P. Gumbert’s catalogue entry, which mentioned that it contained children’s drawings on the flyleaves. While I’m not quite sure they’re children’s drawings (heck, I went to art school for a few years and my drawings are not much better) they are certainly amusing! In addition to pen sketches of Christ and the martyrdom of St Sebastian, there are several colour scenes which (also) have nothing to do with the Chronicque. Here, spanning the entire opening, St George fights the dragon, who is tied to the princess by her girdle while the king and queen of Silene look on from the castle ramparts. In the following opening, male and female courtiers gather in fine dress, meeting toe-to-toe in the gutter. The drawings were clearly added after the book was bound, which could mean a number of things: perhaps the illustrator prized his or her artistry enough to add it to the blank space of a beautiful book or, conversely, maybe the manuscript was not particularly treasured despite its quality and thus a suitable place for ‘doodles’. 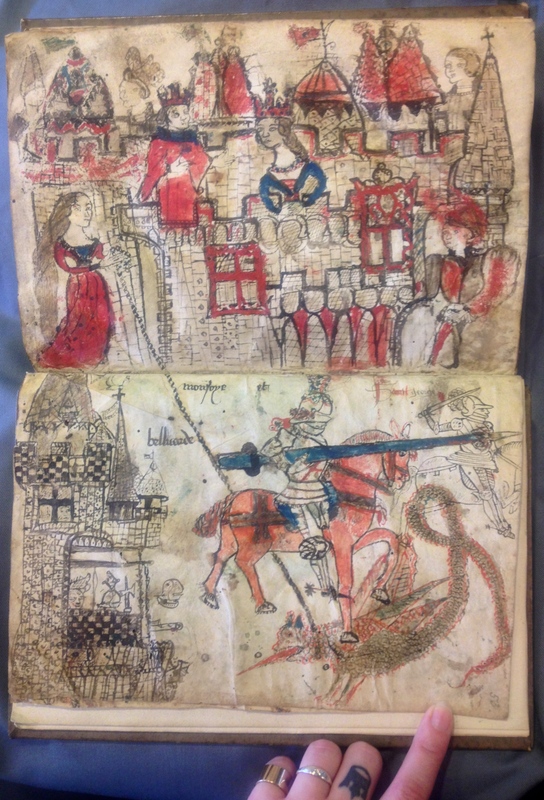 The drawings are contemporary with the later 15th/early 16th-century pen trials and labels found on the flyleaves, and while we cannot discount that the drawings may be intentionally archaic, the detailed clothing and armour also suggest a date within a century of the book’s production. Their impromptu character, random subject matter, and thoughtful (if amateur) detail make them some of the most pleasing and unexpected evidence of a medieval person’s interaction with a manuscript I’ve yet seen. J.P. Gumbert, “Medieval Manuscripts in French in the Leiden University Library: A Handlist” in Medieval Codicology, Iconography, Literature, and Translation. Studies for Keith Val Sinclair, ed. P.R. Monks & D.D.R. Owen (Leiden, 1994), 28-47. J. J. N. Palmer, “The Authorship, Date and Historical Value of the French Chronicles of the Lancastrian Revolution”, Bulletin of the John Rylands Library lxi (1978-9), 145-181. 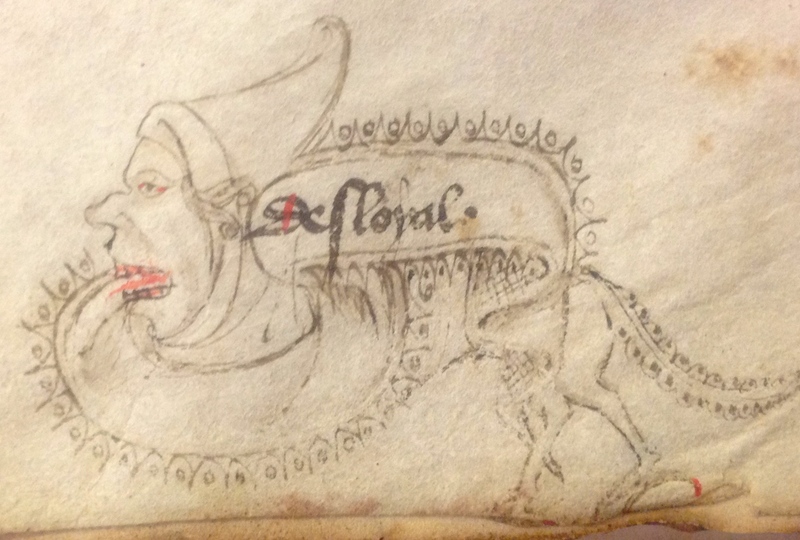 This entry was posted in Jenneka Janzen and tagged Art History, Court, Leiden Library Collections, Lieftinck Lectures, Manuscript, Medieval Doodles, Medieval Illumination, Research Reflections. Bookmark the permalink.